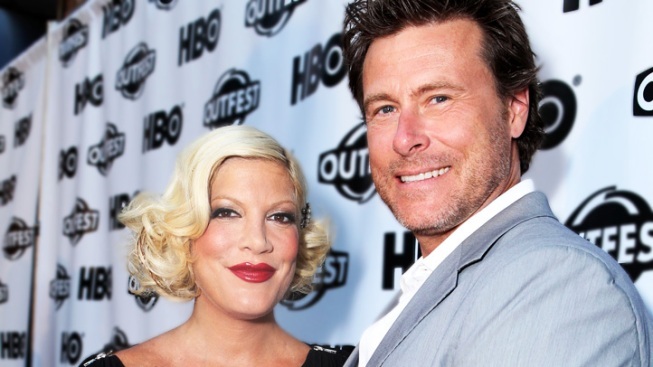 Tori Spelling and her husband, Dean McDermott welcomed their fourth child – son Finn Davey – on August 30. Tori Spelling has been hospitalized following complications from the recent birth of her fourth child. "Tori underwent emergency surgery over the weekend due to complications from her c-section," a rep for the actress told Access Hollywood on Tuesday. "She remains in the hospital and is resting comfortably." Tori and husband Dean McDermott welcomed their fourth child – son Finn Davey – on August 30. It marked Tori's fourth c-section delivery, and second in the span of one year, following the birth of daughter Hattie in October 2011. The proud parents first announced the birth of baby Finn – who weighed in at 6 lbs., 6 oz., and measured 20 inches long — in a post on Tori's blog just a few weeks ago. "We are so excited to announce the birth of the newest member of the McDermott family," the couple wrote on Tori's blog, at the time. Tori and Dean are also parents to son Liam, 5; daughter Stella, 4; and daughter Hattie, 11 months. Dean also has a 13-year-old son, Jack, from a previous relationship. No further details on Tori's hospitalization were immediately available from the rep.